This dynamic two-layered garment is as unique as it is show-stopping! The triangular shawl yoke is edged by fluid hand-twisted fringe, and the crescent-shaped hem of the bodice drapes longer in the back. It's fabulous frolicking fun! 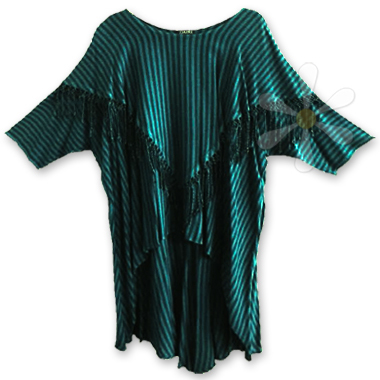 This one in our teal sirocco dye over woven stripes is one-of-a-kind and in stock now! For full details see our regular AMOURAH page.